Millie dreams of being a serious journalist someday even though she doesn't see women who look like her on TV. She plans to jump start her dream by attending a selective summer program for aspiring newscasters but first, she has to tell her mom that she won't be going to the fat camp she has attended every year since she was younger. Millie's mom believes this will be the year Millie will lose the weight and begin her life while Millie feels like she can achieve her dreams regardless of her weight. Callie is a pretty girl for whom things come easy. She knows she's going to be the next captain of the dance team and that this will be the year their team finally wins a national championship. But when one of the team's sponsors drops out, Callie joins the rest of the team on a revenge mission that leads to Callie taking the fall for everyone and doing community service at the gym they vandalized. That's where Callie and Millie begin to discover that they might be more alike than they thought. 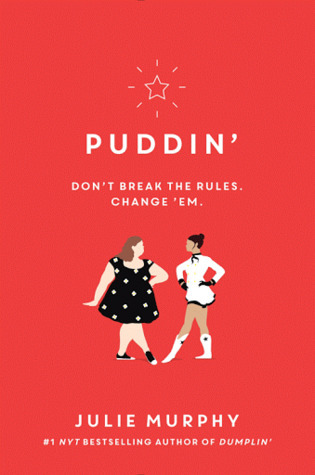 I really enjoyed Dumplin' and was hoping for more in this companion novel but ended up let down by it. Millie is a nice enough character but I never got completely invested in her nor her struggles - which were not all that much of a struggle in the first place. She is so reliably upbeat about everything that she felt surface-y to me. And her friends from the Dumplin' didn't seem to be very involved with her so it felt more to me like one-sided relationships with them just humoring her about the sleepovers. I don't think they cared much at all about maintaining their friendships. Meanwhile, Callie was just a mean girl, pretty much throughout the entire book. Just when you thought she'd started to make some progress, she comes up with an entirely new way to be especially mean to people, all while feeling sorry for herself for being in a situation of her own making. She judges Millie even after they are friends and she's too good for the pudgy guy who likes her and she takes the first opportunity where she's given some trust to sneak out of class to be with her sleazy boyfriend. But I think my biggest issue with the plot was the supposed secret that loomed over Millie and Callie's friendship - the fact that Millie is the one who ID'ed Callie on the video in the first place. And I get that the girls would eventually find out more about each other and become friends, because that's what happens in these kinds of stories, but why would Millie be so nice to Callie in the first place? Shouldn't she have been mean to Callie at first? Callie destroyed so much of Millie's family's dreams. There were enjoyable bits but the overall effect didn't leave much impression.